Do you dream? Do you allow yourself to open that doorway of limitless capability? It’s hard sometimes isn’t it. I feel like opening that doorway, imaginatively dreaming, is allowing yourself to see the reality of your situation, your life, through your highest form of self expression. 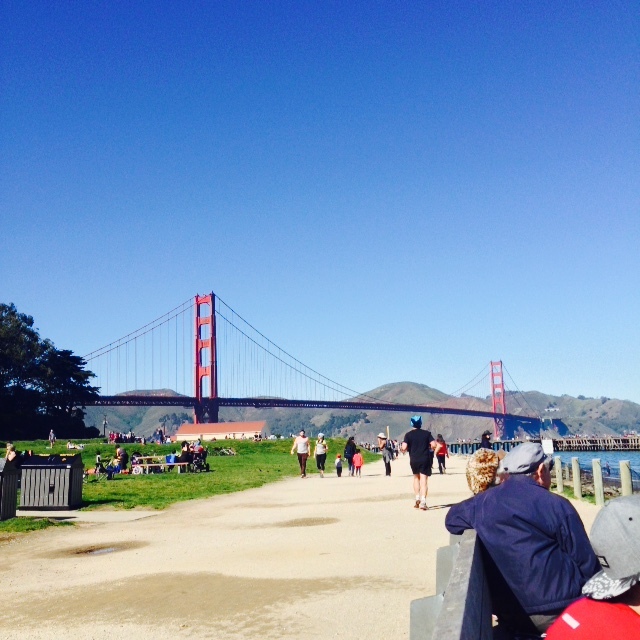 Walking this bridge was only a DREAM 10 years ago! I’m not talking about being a Crossfit Games Champion here. That may be closer to illusory dreaming for me. I am talking about feeling joy and accomplishment in your everyday life, your everyday movements while continuing to excel, progress, and change. 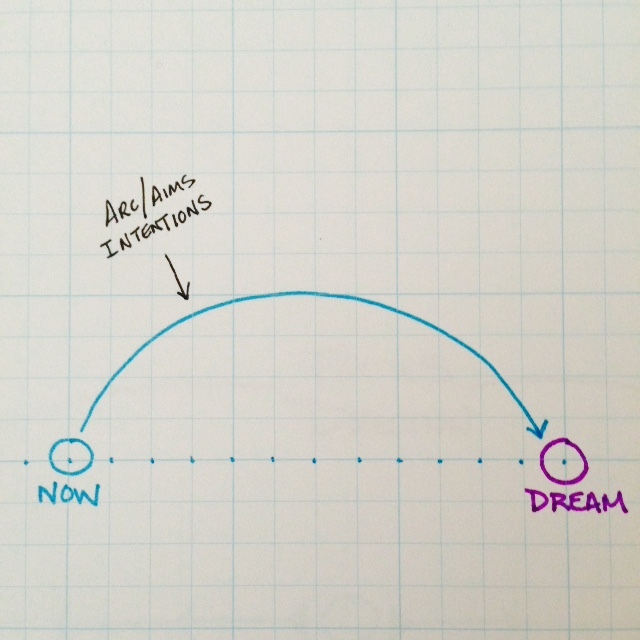 Do those movements aim towards achieving a dream? Or do you base how you move off of what you see in reality, or what has happened? Can you see the difference of FOCUS in these directions? Looking ahead? Or stuck in the past? In order to grow, you need to put yourself in a place where people are consciously growing as well. You can feel the difference in this energy. Do things feel stuck or stagnant? Or do things feel open, adaptable, even joyous? I don’t know about you, but I always intend to aim for the latter. How do you know when to hold, and when to fold? By staying true to yourself. In order to do that, you need to know who you are and what you want. Peel that onion, ask the questions, you’ll always get closer and closer to the truth. I’ve had a tendency in confusing the feelings of wanting to grow, with guilt that maybe I wasn’t appreciating everything I had. And so in order to honor what I had I made sure to sit in it, sit STILL in it. But then I realized, that wasn’t true honor, for honor is motion, it is action. So it’s almost like the desire to grow, to improve through excellence, is ALSO the energy of gratitude, appreciation, and acceptance of everything that is now. For I would not know which direction TO grow if I didn’t fully accept where I am now. Acceptance of the Now, is honoring your past, where you’ve been, and learning from it. But then it must be released, for in the release is the surrender, and surrender is acceptance of True Power. It’s like breathing. The exhale is gratitude for the inhale, and the pause in between those two, the space, is the honor of their relationship. We need them both. It is constant motion. Dreams are energy. The energy moves through that open doorway, which you can choose to open, or not open. Dreams allow a pathway of inspiration that will energize your movement towards goals. Translate this into Physical action, and you’ve got actualization. But what do we do when we get hung up about our own dreams? What do we do when our hearts get broken and dreams suddenly shatter into pieces? The ground shifts. Reality has cracked. What did I do all of this for? Sometimes the feelings can even sink into… I wasted my time. But did you really? How do you know you’re not exactly where you’re supposed to be, but the dream just helped your movement towards a becoming of who you are and where you are now. So that you are a better version of you, a ready version, one that is capable, for whatever was going to inevitably happen anyway. What also happened is that the pieces and the framework of the dream shattered. And I wasn’t prepared for it. I stood there amongst my accomplishments seeing exactly what I had hoped was going to play out while being so very excited for it. But then in a blink of an eye, it was gone. The dream vanished with the death of my Father. And So, I stopped dreaming. Death, Grief, Loss… It broke my Heart into so many pieces, that I just couldn’t figure out a way to put them back together. I had lost any sense of How to dream. The world changed, and until I moved through the feelings of grief, to allow myself to reacquaint myself with Life Now, I would be dreaming in the past. Off of past realities. Taking steps towards your dreams. Move towards what moves you. Not towards what you ‘think’ will work or do the trick. It’s an honest step. It is acknowledging trust in your movement through life. Sometimes these steps are the hardest. Moving towards The Unknown. 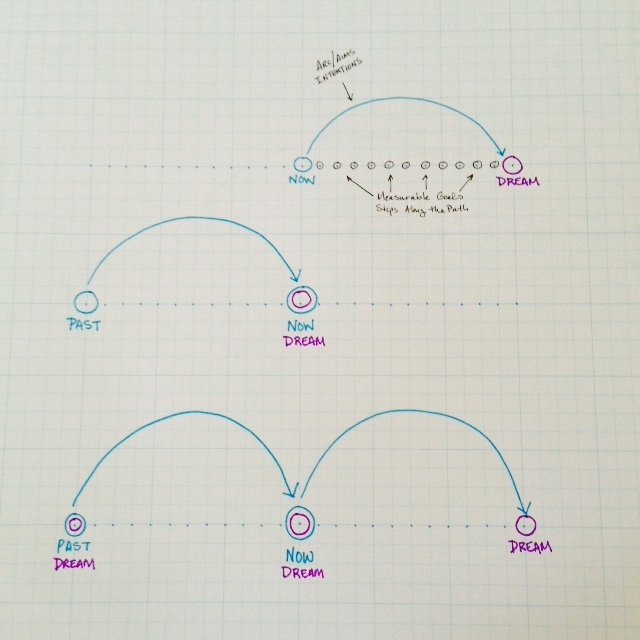 What is the interaction between dreaming and setting goals? Are your goals aligned with your dreams? I see dreams and dreaming like a trajectory aim or arc. Fully invested through your Heart. Start where you are Now, and shoot your Dream out into The Unknown. 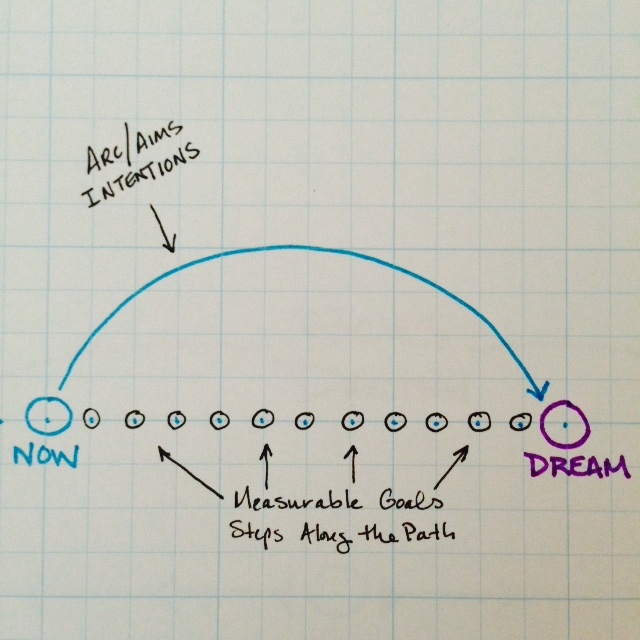 I see setting goals as measurable points along the path headed towards your dreams. Use your head to create those measurable points. Now you’ve got smaller achievable goals moving towards your Dream. How do we make sure that the measurable goals we are setting for ourselves are actually pointing us in the direction of our dreams? I think all of these things happen on an unconscious level. Whatever you do in your life is a step on the path towards wherever you are headed. 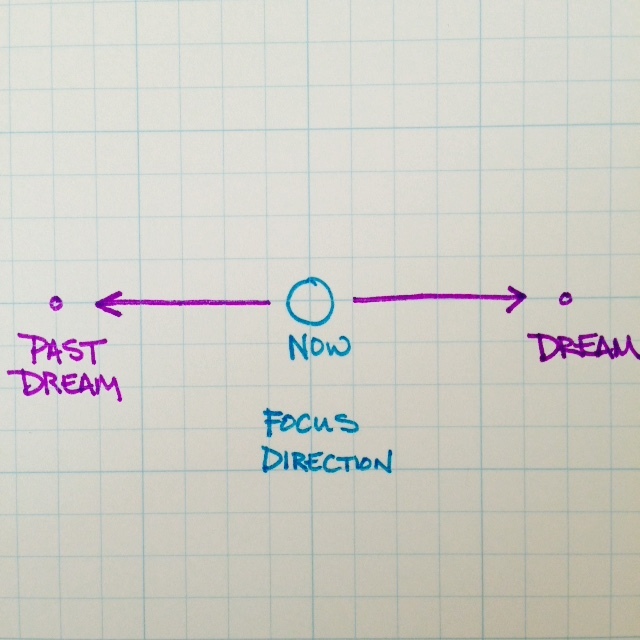 The direction is operating whether you are conscious of it or not. Once you realize this, and start making attempts to be more involved, to be more of a conscious creator of your dreams, you’ve reached the space of Active Participation. But, how do you know if it’s working or not? One of the things that I like to do is back track my goals. Do a review or reflection session on what it is I was aiming for in the past. I understand that where I am now, is the end of a trajectory aim I once shot out in the past. Reflection/Review is a combination of acknowledging who I am, where I’ve been, and where I want to go in one fell swoop. I become aligned with what I am capable of in reality, while also allowing myself to dream into The Unknown. Arc B: Observation from Now of Past Dreams. For reflection/review. Arc C: Their Relationship/Interaction and How that affects How You Operate now. All of this happens at every point along the journey. Now, there were goals and dreams that I thought about and wished for ten years ago. 2005, I was in the midst of the gutter, the bottom of the barrel. I’d sunken to an all time low. I had graduated college, but that was my only goal, so I didn’t know what to do next. I sat in that directionless feeling for quite some time. I kept digging the hole deeper and deeper creating worsening situations for myself, until it got so bad that the only choice I had was to set a goal of climbing up and out of that pit. Every time I’ve felt directionless in my life, is because I have failed to set goals. I only recognize this in hindsight, reflection, review. And so, here I am again, trying to take the rein’s in this goal setting business of life. I think it’s important to set goals, and you have to fully invest yourself into them. You have to believe with all of your Heart that you’ll get there, that it’s what you want. However, in the very same breath, you have to live openly, fluidly, to what Life is presenting you. As you open, the clues of Life will help you move closer to your truest Goals. Which we all know is Love, the beauty of Love is in the expression, the experience, the creativity of sharing infinite wells of Love. Connection. How does all of this Apply to Fitness? Glad you asked. Fitness is a physical operation point. 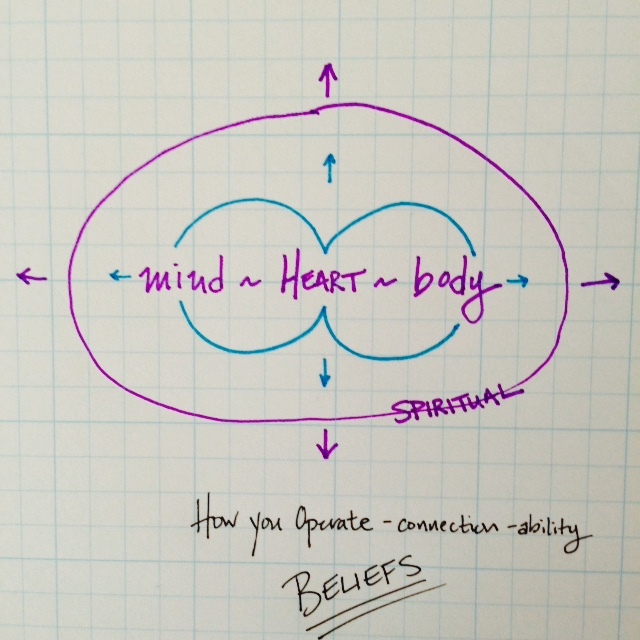 How you operate with Fitness in your life, is a clue of how you are operating mentally, emotionally, and spiritually. Start setting and achieving fitness goals, and you’ll find the other areas in your life start aligning. MIND. HEART. BODY. SPIRIT. It is all connected. We are all connected. Where I see a lot of people get mixed up, is in How they set their goals. They base their trajectories off of what someone else is doing, achieving, or possibly even what they look like. And so the feat seems endless, even unattainable, because it’s not Your Goal for Your Life. Start Where you are, Now. Be very clear about your answer. Then, review where you’ve been. Apply lessons to new destination. Let go of the past to allow miracles in the now. Moving on the path of progress.